Theses boxes are made of quality SBS board, white inside with black gloss outside. Note that the black finish will not show finger prints. These lock-corner style boxes are .016 gauge board, the same as our SBS window boxes for the smaller sizes, increasing in gauge as needed for larger sizes. Note that the 10x10x5 is a sturdy .020 gauge SBS; the 14x10x4 (1/4 sheet) is .022 gauge; and the 19x14x4 (1/2 sheet) is .024 gauge SBS. Available in many popular sizes. Perfect for cookies, pastries, candies, chocolates, etc. The most popular cupcake sizes (with inserts) are here. Also the three most popular decorated cake box sizes. 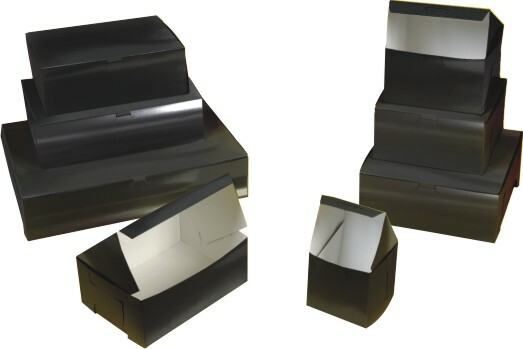 Please click here to see our 100% recyclable kraft interior, white exterior cupcake inserts.